12 Variety Vacuum Sealing Storage Bags: 12 variety packs of vacuum space saving bags can meet your variety storage needs to save 80% space. 12 variety storage bags include: 3 jumbo size (40\"x32\"), 3 large size(32\"x24\"), 3 medium size(28\"x20\") and 3 small size( 24\"x16\"). All those storage bags can works well with any home vacuum cleaner. 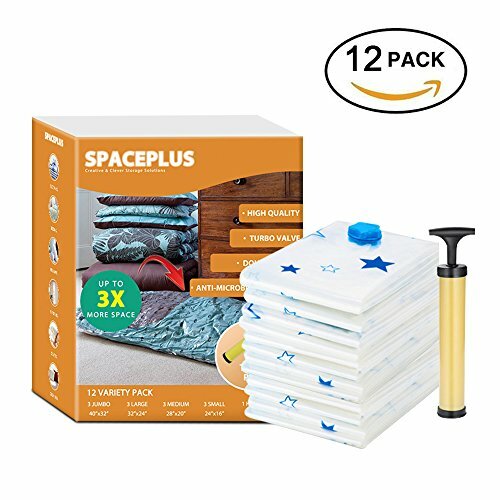 SAVE 80% MORE SPACE: The space saver compression bags is ideal for storing duvet, clothes, comforters, blankets, pillows, plush toys and more. The SpacePlus space saver vacuum storage bags can be reused for many times and last for serval years. THICKER AND STRONGER: 25% thicker and stronger PA and PE material than other vacuum compression bags. Better sealing performance with double-zip seal and triple-seal turbo. This valve designed storage bags can get every ounce of air OUT of the bag in the suction process - and nothing gets back in! NO MOLD,MILDEW OR BACTERIA: Anti-microbial materials mean you won\'t have to worry about the long-term effects of storage in an air-tight bag. Squeeze every bit of air out of the bag in the process of air extraction.Say goodbye to mildew, bacteria, insect, dampness. LIFETIME REPLACEMENT & MONEY BACK GUARANTEE! If you are not satisfied with our SpacePlus Storage Bags, you can return the bags and we will REFUND your money with NO QUESTIONS ASKED! You take NO RISK by ordering today!